Plug-and-Play: No Need for Remote Control! Just Plug & Shoot, Battery, and Wi-Fi Not Needed for the Perfect Selfie! Simply plug the small wire into earphone jack. The integrated button allows you to take photos without Bluetooth or extra batteries. Shutter Button In The Handle: Minisuit SELFIE STICK features Built-In remote shutter on the handle! Get a head above the crowd at every wedding, concert, & ball game! Extendable handheld selfie stick fits Apple iPhone 6 Plus, 5 4 3, Samsung Galaxy S5 S4 S3 S2, Note 4 3 2, HTC One M8, LG G2 G3 G Flex, Motorola Moto E G X, Nexus 5, Nokia Lumia, Sony Xperia, and more! Perfect for traveling: An extremely lightweight 0.3 pound [4.2 ounces], monopod extends up to 2.8 feet [200-850 mm]. Adjustable ball-head-and-thumb screw locks for multiple angles with 180 degree position. For Android devices, please be sure have had a stock camera function wherein the up- volume button serves as a physical shutter button on the camera. If you are still having trouble, please download the app "Camera360" from Play Store. For Apple devices, please be sure have the latest iOS update. Advantages Over Bluetooth Selfie Stick No pairing. No recharging. Just plug in the headphone plug to your phone's headphone jack and take the picture. Portable & Convenient High sensitive buttons and portable light design, easy to take. Superior Quality, Nalanda Create! 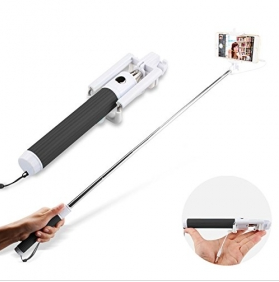 The "selfie stick"- a small, Intelligent lightweight designed. Stainless Steel with superior quality rubber material, Build a stable, solid, robust shape structure, more lightweight and flexible is not easy to damage. User-friendly Design - We Know Your Demand Better You could hold the phone solidly in stable position the extension rod is tight therefore the device is useful. 180 degree rotation With adjustable clasp helps you get the right angle. What A Traveler's Gem! Works with all iPhone and most Android phones above 3.5. The removable smartphone adapter holds your device safely with soft padded grips and spring loaded strength. It is adjustable 180 degrees to get that artistic angle you want.